One of the most common topics NYSHA is asked to address is animal cruelty — what the laws are, how to report it, what can be done to stop it. The answers are not always easy. Actually working in the field is more complex and challenging than one might imagine. 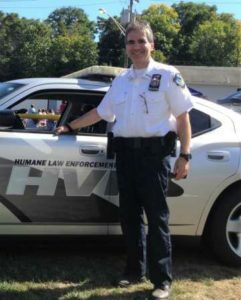 Since one of our board members is a humane investigator, we asked him to share an inside look at his job. Marc Kissel, also an attorney, explains that each situation is different and education is often as important as enforcement. We may be called upon to enforce other criminal laws. We have powers of arrest, may apply for search and arrest warrants, file criminal complaints, and testify in court to support the criminal charges that we or other law enforcement agencies have brought against people accused of animal abuse. Since one of our board members is a humane investigator, we asked him to share an inside look at his job. Marc Kissel, also an attorney, explains that each situation is different and education is often as important as enforcement. Our mission is to enforce the laws, regardless of our personal feelings on how animals should be treated. We are not here to break the bond between people and their pets. We try hard to solve problems without an arrest. Often a reminder or education fixes the problem. Sometimes we help people and their animals by acting as good Samaritans, not strictly as peace officers. But there are circumstances when the situation calls for an arrest. We take that authority and responsibility seriously, and try to make good, solid cases. Ultimately, we speak for the animals, and in doing so, strive to make society a better place for people too. Each case develops differently. An interesting case started when our SPCA received a call from a groomer about an elderly dog brought in with overgrown nails and terribly long and matted fur. The groomer sent us photos of maggots around the dog’s hindquarters. We asked the groomer to continue the shaving process, because although it might taint the evidence, the dog needed immediate relief. Matted fur can be very painful and dangerous if it cuts off circulation. The dog was described as listless. Considering it an emergency, we took the dog to a veterinarian, along with the fur clippings and maggots. The veterinarian gave us a report, affirmed under oath so it could be used to support a criminal charge. (The form was from the NYSHA website). The dog had multiple problems, ranging from dental to internal organ issues, some which were or might be age-related, but others were clearly the result of neglect. Fortunately, the maggots were not internal, but were living in the feces accumulated at the hindquarters. This was a situation requiring more than just education. In addition to the veterinarian’s report, we obtained sworn statements from the groomer and another witness. We then advised the dog’s owner of the findings of the groomer and the veterinarian. We had decided to make an arrest before calling the owner, so no questioning took place over the phone. Instead, we made arrangements with him to come to the police station to be arrested. The owner’s demeanor and cooperation during the phone call were taken into account in making the decision to allow a voluntary appointment for processing. If he had not cooperated or kept the appointment, we would have made a more dramatic arrest. The owner was fingerprinted, photographed, and processed. He appeared respectful and thankful for our intervention in assisting the pet. Based on all the circumstances, including voluntarily coming in, he was given an appearance ticket and released from custody to go home. The charge was Section 353, a misdemeanor, and was filed with the court before the appearance date. Meanwhile, our SPCA cared for the dog, following the veterinarian’s treatment plan. This owner was completely contrite and apologetic. We formed the opinion that, despite the serious nature of the neglect we found, the incident was accepted as a wake up call. The remorseful owner cooperated. It was determined that, with court-required monitoring, the best thing for this 17-year-old dog was to be returned to the only home she knew, and we would keep an eye on things. Clearly the arrest was appropriate, as was the disposition. The dog was brought back to the full health that an elderly canine could be expected to have. She lived the rest of her life in the only home she knew, with court-required supervision of her care. Her owner knows that our shelter is available to assist with medical issues, but that it is the owner’s responsibility to care for the dog. The owner agreed to the disposition and pled to the charge of misdemeanor animal cruelty. The sentence was suspended pending proper supervised care of the dog for a year. If that year passed with compliance, the owner would be allowed to withdraw the plea and it would be reduced to a disorderly conduct charge. The owner was fully cooperative with veterinary care and SPCA visitation, so at the end the misdemeanor charge was withdrawn and a guilty plea of disorderly conduct substituted. This was an unusual case in that the owner was truly contrite, acknowledged his failings, and agreed to close supervision. All felt that placing this elderly dog in another home would be unfair to this animal. Clearly the arrest was appropriate, as was the disposition. The dog was brought back to the full health that an elderly canine could be expected to have. She lived the rest of her life in the only home she knew, with court-required supervision of her care. Her owner knows that our shelter is available to assist with medical issues, but that it is the owner’s responsibility to care for the dog. Recently the dog passed away due to old age, but in her home and with her family. Not all cases are so neatly packaged, and not everyone would agree with returning the dog. But all those involved are satisfied that the outcome was the best it could have been. Each case is unique and requires an individual approach. The process can be long and complicated, and a team effort is needed. We depend on the public to take the first step to report cruelty so that a day in the life of an SPCA agent can be a lifeline for an animal in distress.